On the night of December 27, 2005, nine katyusha rockets were fired from Lebanon into Israel. Four rockets hit the town of Kiryat Shmona, while another hit the Western Galilee town of Shlomi and four landed in open areas. Two houses in Kiryat Shmona sustained heavy damage, and four residents were treated for shock. 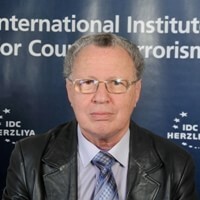 IDF intelligence estimated that the Popular Front for the Liberation of Palestine - General Command, headed by Ahmed Jibril, was responsible for the katyusha fire - probably in coordination with Hizballah. As a consequence, on December 28 Israel Air Force fighter jets fired two missiles at a PFLP-GC training base at Na'ameh, about seven kilometers south of Beirut, slightly wounding two fighters. On December 29, al-Qaida's Committee in Mesopotamia (Iraq), led by Abu Musab al-Zarqawi claimed responsibility for the rocket attack. According to its statement, after "careful planning and intelligence gathering, a group of al-Tawheed lions and Al-Qaida operatives put their faith in Allah and launched a new attack on the Jewish state… [with] ten Grad rockets from Muslim territory of Lebanon toward selected targets in the northern part of the Jewish state…This blessed attack was carried out by the mujahideen in the name of Mujahid Shaykh Usama Bin Laden, the commander of Al-Qaida... With the help of Allah, what is yet to come will be far worse." Sources in the IDF said it was difficult to determine the announcement's reliability. It should be noted that there is an al-Qaida affiliate in Lebanon, Usbat al-Ansar, comprised of radical Sunni Palestinians from the Ayn al-Hilwah refugee camp in southern Lebanon. On August 19, 2005 an al-Qaida grouplet calling itself the Abdallah Azzam Battalions fired three katyusha rockets from Aqaba, Jordan. One of the rockets landed near Eilat's airport, while another narrowly missed an American ship in the Aqaba harbor and another hit a group of Jordanian soldiers. Until his ouster from Afghanistan in the winter of 2001/2, bin Laden gave Palestine low priority. For him, the heart of the matter was the US presence on the holy soil of Saudi Arabia, which he saw as the bridgehead of a corruptive non-Muslim culture. Throughout bin Laden's public statements and declarations is one fundamental and predominant strategic goal: the expulsion of the American presence-both military and civilian-from Saudi Arabia and the entire Gulf region. Bin Laden and the WIF (World Islamic Front for the Fight against Jews and Crusaders) he created did not forget what they saw as crimes and wrongs done to the Muslim nation: "the blood spilled in Palestine and Iraq…. the massacre of Qana, in Lebanon… and the massacres in Tajikistan, Burma, Kashmir, Assam, the Philippines, Fatani, Ogadin, Somalia, Eritrea, Chechnia, and in Bosnia-Herzegovina." Yet it is worth noting that the Palestinian issue was given no special prominence. According to Abdel-Bari Atwan, editor of the London-based al-Quds al-Arabi, bin Laden "has been criticized in the Arab world for focusing on such places as Afghanistan and Bosnia-Herzegovina, and [he] is therefore starting to concentrate more on the Palestinian issue." Following the destruction of al-Qaida's bases in Afghanistan, the al-Qaida leaders Osama bin Laden and Ayaman al-Zawahiri mentioned Palestine more and more in their released videos and audios as a top priority and in parallel there was a sharp increase in attacks by jihadist groups against Jewish and Israeli targets. On May 16, 2003, 15 suicide bombers attacked five targets in Casablanca, Morocco, killing 43 persons and wounding 100. The targets were a Spanish restaurant, a Jewish community center, a Jewish cemetery, a hotel, and the Belgian Consulate. The Moroccan Government blamed the Islamist al-Assirat al-Moustaquim (The Righteous Path), but foreign commentators suspected an al-Qaida connection. On November 15, 2003, two suicide truck bombs exploded outside the Neve Shalom and Beth Israel synagogues in Istanbul, killing 25 persons and wounding at least another 300. The initial claim of responsibility came from a Turkish militant group, the Great Eastern Islamic Raiders' Front, but Turkish authorities suspected an al-Qaida connection. On November 28, 2002, at least 15 people died in the first suicide attack by al-Qaida against an Israeli target: an Israeli-owned hotel in Mombassa, Kenya. A large part of the Paradise Hotel was reduced to rubble and nine Kenyans and three Israelis were killed. A parallel attempt to fire two missiles at an Israeli holiday jet (an Arkia airline plane-a Boeing 757 carrying 261 passengers) that had taken off from the city’s airport-failed. The reason for this sudden interest in Jewish and Israeli targets was most likely the result of al-Qaida’s and associates groups’ attempts to bandwagon what was considered at that stage a very successful violent al-Aqsa intifada by Hamas, Palestinian Islamic Jihad (PIJ), and other Palestinian groups. On the one hand, it permitted them to claim their support to the Palestinian people, but at the same time it created an anti-Jewish and anti-Israeli terrorist campaign which would attract more solidarity and support from the Arab and Muslim masses and possibly attract more young recruits to their ranks. More recently, in August 2005, four Israeli cruise ships carrying a total of 3,500 tourists scheduled to dock in the Mediterranean Turkish resort of Antalya were rerouted to the island of Cyprus by the Israeli authorities due to fear of a terrorist attack. A Syrian citizen named Louai Sakra was arrested for plotting to slam speedboats packed with explosives into the cruise ships filled with Israeli tourists. … [I]n the context of the Islamic Jihad by our mujahideen brothers of al-Qa'ida's World Organization against the Jews and Crusaders. We declare that the Brigades are not a new or passing organization on the land of Palestine, but a [true] believer spirit that urges on the mujahideen to make themselves into a single rank. In September 2005, Mahmoud Waridat, a West Bank Palestinian arrested in July the same year, was charged by IDF prosecutors with undergoing training at an Qaida camp in Afghanistan in the summer of 2001, though it was said the defendant later declined an offer to join bin Laden’s global network. A leaflet distributed in Khan Yunis in October 2005 by al-Qaida Jihad in Palestine announced that the terrorist group had begun working towards uniting the Muslims under one Islamic state, the only way for Muslims to achieve victory over their enemies. The leaflet is the latest indication of al-Qaida's effort to establish itself in the Gaza Strip after the Israeli withdrawal from the area. On the eve of the disengagement, a number of rockets were fired at the former settlements of Neveh Dekalim and Ganei Tal. An announcement claiming responsibility on behalf of al-Qaida members in the Gaza Strip was made by three masked gunmen who appeared in a videotape. Al-Qaida's new on-line television channel branded PA chairman Mahmoud Abbas a "collaborator with the Jews," accusing him of assisting Israel in its war on Hamas. Although from the beginning of the war in Iraq and its immediate aftermath many Islamist groups were involved in the fighting against the US and coalition forces, the Jordanian-Palestinian terrorist Abu Musab al-Zarqawi was considered to be the most dangerous leader of the most dangerous group connected with al-Qaida. At some point, most likely after the occupation of Iraq in April 2003, he split from Ansar al-Islam and created his own organization, which he called al-Tawheed wal Jihad (Monotheism and Jihad). The successes of the Zarqawi group during the two and a half years of terrorist and guerrilla activity and the continuation of their painful strikes against the coalition forces and primarily against the officials and security forces of the new Iraqi government has attracted more and more groups and volunteers to his ranks. Although for a long time he was considered the representative of al-Qaida in Iraq, it was only in December 2004 that his allegiance to bin Laden and al-Qaida materialized. According to Zawahiri, the jihadists in Iraq under Zarqawi's leadership should act in several stages: first, expel the Americans from Iraq; then establish an Islamic authority or emirate; the third stage would extend the jihad to the secular countries neighboring Iraq. Only in the fourth stage, which could be parallel to the third one, the jihadists will "clash with Israel, because Israel was established only to challenge any new Islamic entity." According to a book published in July 2005 by Fuad Husayn, the future strategy of Abu-Mus'ab al-Zarqawi is based on expanding the conflict with the United States and Israel and involving new parties in it. Simultaneously, a broad-based Islamic jihadist movement "will assume responsibility for changing the circumstances that have long prevailed in the region and for establishing an Islamic caliphate state in seven stages with Iraq as its base." Zarqawi's enmity toward the United States and Israel was very obvious since both countries represented the forces of atheism and oppression against justice. He said that he did not fear their number, weapons, or alliance with other forces of evil against Muslims. the Salafi-jihadists in Iraq, led by al-Zarqawi, see the Iraq conflict "as a springboard for a wider regional conflict that has as its central aim uprooting the current political order in the region." In a message from Zarqawi to members of his Bani-Hasan tribe, he called on his cousins to strive to raise the banner of Islam and initiate jihad against everyone who stands in the way of fighting the Israeli occupiers of Palestine. Declaring that his clan had roots in Jerusalem, Zarqawi said: "It is your glory and pride and the glory of your fathers and forefathers who had the honor to fight alongside other tribes under the banner of Salah al-Din al-Ayyubi in Hittin to liberate Jerusalem…Protect Jerusalem. It is the place from where your great grandfather ascended to heaven." In his address to the Islamic nation in April 2004, Zarqawi said that the US invasion had the objectives of keeping the Islamic nation in an endless state of weakness and defending Israel's security and eliminate every possible threat against it. Al-Qaida decided that its ultimate priority was to embark on a direct confrontation with Jews in Palestine in the near future, which will win it the support of all Arabs and Muslims. Al-Qaida believes there is a substantial link between the ruling Arab regimes and the state of Israel and therefore an attack on Israel would weaken these regimes. Turkey, located north of Iraq, is viewed as the most important Islamic state because of its great economic and human resources and significant strategic location. Zarqawi believes that Turkey lacks self-determination and freedom because "the Jews of Dunma" control the army and the economy and are the real powerbrokers in the country. Therefore, Turkey's return to the ranks of the nation "will not happen unless a powerful strike is dealt to the Jewish presence in that country." Al-Qaida's current strategy is to infiltrate Turkey slowly and postpone major operations there until major gains are made in Iraq. Iran is the second country that al-Qaida seeks to involve in this conflict. Zarqawi evaluates that the US-Israeli confrontation with Iran is inevitable and could succeed in an attack on its nuclear infrastructure. Accordingly, the Iranian regime is preparing to retaliate and expand the area of the war, but it could lose its ability to control the situation. Consequently, Zarqawi is drawing up a plan which would include the passage of Taliban supporters from Afghanistan through Iran to Iraq, the free movement of thousands of Zarqawi's people through the territory of a weakened Syrian regime and the opportunity to infiltrate into Lebanon [author's emphasis]. The situation in Lebanon will not remain stable, as the Sunnis in Lebanon and Syria are supportive of al-Qaida's doctrine. Al-Qaida, therefore, has the potential and resources to infiltrate into Syria and Lebanon in the event of an attack on Iran. According to al-Qaida's "intellectuals," the occupation of Baghdad on 9 April 2003 initiated an "eye-opening stage" which will last until the end of 2006. During this stage, al-Qaida aims "to prolong the confrontation with the enemy," since "it views such a confrontation as a victory, regardless of the consequences," during which it will transform itself from "a network into a mushrooming invincible and popular trend." During this stage, the second generation of leaders within al-Qaida plans to engage in direct confrontation with the State of Israel in Palestine [author's emphasis]; burn Arab oil and deprive the West and proxy regimes of benefiting from oil revenues; prepare for the stage of electronic jihad via the Internet; proceed with the establishment of power in vital areas of the Arab and Islamic world; take Iraq as a base to build a new army of jihad to be redeployed in neighboring countries. Al-Qaida ideologues give themselves a time frame of approximately three years to carry out the next stage, from the beginning of 2007 to the beginning of 2010, during which "the focus will be on Al-Sham." By the end of this stage, Al-Qa'ida will have completed its preparations to engage in direct clashes with the State of Israel, both in Palestine and on Israel's border. 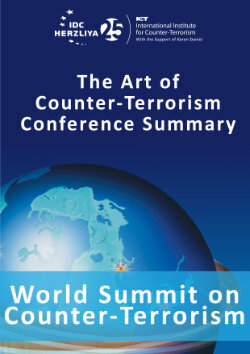 In Husayn's detailed analysis, there are seven stages in al-Qaida's strategy, from the first "awakening" stage of 9/11 to the final one beginning in 2016, immediately after the establishment of an Islamic state, which "will be the outset of the all-out confrontation between the forces of faith and the forces of global atheism." However there are some contradictions concerning the goals and foreseeable events in each stage, which are not meaningful to be discussed here. The significant thing in this analysis is the importance Zarqawi and other al-Qaida strategists attach to their direct involvement in the fight against Israel, the necessity to infiltrate a weakened Syria and Lebanon and attack Israel through the Lebanese border. This strategy is also based on a predicted change in Iran's strategy in the region following a foreseeable US and/or Israeli attack against its nuclear installations. Interestingly, in his last letter to Zarqawi, Zawahiri stresses that "more than one hundred prisoners - many of whom are from the [al-Qaida] leadership who are wanted in their countries - [are] in the custody of the Iranians." Zarqawi’s attacks against the Shia in Iraq could compel "the Iranians to take counter measures." Therefore, al-Qaida "and the Iranians need to refrain from harming each other at this time in which the Americans are targeting" them. In the months since Husayn's book was published, significant changes have taken place in the region that could have hastened the implementation of the aforementioned al-Qaida strategy: the Syrian regime is each day weaker and cracks appear in its ranks after the publication of the UN inquiries in the assassination of Rafik Hariri; the Lebanese arena is boiling and there are greater pressures to disarm Hizballah; and more significantly the hour of the confrontation between the Iranian regime and the international community on the nuclear issue is approaching. On this background, although it is still possible that Hizballah or one of its Palestinian allies were behind the December 27 bombing of northern Israel, the claiming of responsibility by Zarqawi's al-Qaida Committee in Mesopotamia should be taken seriously. It is possible that the stage of al-Qaida and Iran refraining "from harming each other" has already passed and the moment has arrived when the Iranian regime, in coordination with Assad's regime or Hizballah, have decided to give a free hand to al-Qaida to do their "dirty work" for them. See Erik Schechter, 'Did al-Qaida hit Kiryat Shemona?' Jerusalem Post, December 29, 2005. See Ely Karmon, "Terrorism a la Bin Ladin is not a Peace Process Problem," PolicyWatch, No. 347, The Washington Institute for Near East Policy, October 1998. See "Letter from al-Zawahiri to al-Zarqawi," ODNI News Release No. 2-05, October 11, 2005, at http://www.dni.gov/letter_in_english.pdf. The Office of the Director of National Intelligence released the letter dated July 9, 2005, obtained during counterterrorism operations in Iraq. This sub-chapter is largely based on citations from a book by a Jordanian journalist who is considered to be an expert in Zarqawi's life and activity. See Fuad Husayn, The Second Generation of Al-Qaida, a serialized book on Al Zarqawi and Al-Qaida published by the London al-Quds al-'Arabi, July 11, 2005. See also Yassin Musharbash, "What al-Qaida Really Wants," Spiegel Online, August 12, 2005, at: http://service.spiegel.de/cache/international/0,1518,369448,00.html. See Murad Al-Shishani, 'Al-Zarqawi's Rise to Power: Analyzing Tactics and Targets,' Terrorism Monitor, Jamestown Foundation, Vol. 3, No. 22, November 17, 2005. Fuad Husayn, The Second Generation of Al-Qaida. Donmeh (dönme) is a Turkish word for a religious convert. It refers to a group of Jews of the Near East who followed Shabbatai Zvi and converted to Islam in 1666. Zvi's conversion is generally understood to have been forced. While outwardly Muslim, the Donmeh secretly remained Jews, continued to practice Jewish rituals covertly and worshipped Shabbatai Zvi as the Messiah. Some of the original Donmeh were Muslims who were converted to Sabbatianism. Several Donmeh were among the Young Turks, Turkish intellectuals who tried to reform the Ottoman Empire. They strongly supported the pro-Western and secular reforms of Kemal Ataturk, an attitude that bolstered the suspicions of Islamists towards them. See at http://en.wikipedia.org/wiki/Shabbatai_Zvi. See Letter from al-Zawahiri to al-Zarqawi.